A charity concert “Hvorostovsky and Friends for Children”, organized by Dmitry Hvorostovsky’s family and friends, will be held at the Great Concert Hall of Krasnoyarsk Region Philharmonia. It is arranged with the support of the Government and the Governor of the Krasnoyarsk Region. The concert of such scale with the participation of the world opera stars will take place in Krasnoyarsk for the first time. A little more than half a year has passed since the world lost Dmitry Hvorostovsky. A great opera singer, a man with a big heart, in which he accommodated the fates of many children who need help and support. 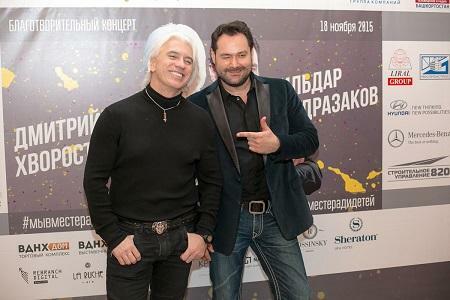 Not only the artist, but also the founder of “Dmitry Hvorostovsky and Friends for Children” project. This kind and necessary project he created together with his wife Florance, friends Pavel Astakhov, Vasily and Tatyana Peganovs. It is Florence Hvorostovskaya who still remains the main inspirer of the project, the idea of which was taken up by a lot of people, thanks to them it continues to live. For the first time the charitable concert “Hvorostovsky and friends for children” was held in 2014 in Moscow. Another one was held a year later in Ufa, where it was possible to collect more than 20 million rubles to help sick children. These concerts were organized by Dmitri Hvorostovsky, the Children’s Rights Ombudsman under the President of the Russian Federation Pavel Astakhov and Rusfond. Subsequently, Florance Hvorostovskaya proposed to continue this initiative in the homeland of the great baritone. Dmitry loved his native Krasnoyarsk for a special “Siberian spirit”, for the greatheartedness and freedom of his countrymen. On August 26, Dmitry Khvorostovsky’s family and friends together with the Government of the Krasnoyarsk Region and with the participation of Rusfond organize a charity concert “Khvorostovsky and Friends for Children”. It will be held on the square at the Great Concert Hall of the Regional Philharmonia, where last June Dmitry Hvorostovsky gave his last concert in Russia. Leading soloists of the world opera will take part in it – friends of Dmitry Hvorostovsky – Ildar Abdrazakov, Hibla Gerzmava, Stephen Costello, Aigul Akhmetshina, Borislav Strulev. The concert will be accompanied by the Krasnoyarsk Academic Symphony Orchestra, conducted by Dmitri Hvorostovsky’s friend Konstantin Orbelyan. He accompanied most of the singer’s performances. Young talents of the Krasnoyarsk Region will also take part in the program of the concert. Soloists of the Krasnoyarsk Opera and Ballet Theater named after D.A. Hvorostovsky – Daria Frolova, Sevastyan Martynyuk, Denis Grechishkin, Pavel Antsiferov and students of the Krasnoyarsk Institute of Arts, that the great Siberian singer graduated from, Media office of Kultura24 reports. During the concert, the entrance to Mir Square will be free. A separate guest area will be set up directly in front of the stage. The estimated cost of an entrance ticket starts from 10 thousand rubles. Everyone can make a donation right away by sending an SMS message to the short number 3434 with the prefix of the ДХ, indicating the amount through a space. All collected funds from the sale of tickets and SMS will be transferred to the Charity Fund named after Dmitry Hvorostovsky to assist the children-mentees of Rusfond and Krasnoyarsk charity fund “Happy Children”. “We are together for the sake of children” – this phrase by Dmitry Hvorostovsky became the motto for the organizers and participants of the concert. “Friends, we have been silent for a long time. It was time of awareness, acceptance and sorrow. But the importance of the common cause, for which we have gathered together, the cause started by Dmitry during his lifetime, the great responsibility for the destinies of children motivates us to continue this mission. Our goal is to create the civil responsibility of society to the most unprotected, helpless members of it – to our children, who are in the most difficult situation. We will ask for help from our friends and we will share what we have – interaction with the talent and creativity of our friends. With the help of creative events and communication with outstanding people of culture and art we will create a civil, friendly environment in which the suffering of children will be less. We are proud to announce the first concert in Dmitry Hvorostovsky’s memory in his homeland, in Krasnoyarsk. It will be held on August 26, on Mir (Peace) Square. We are waiting for you, friends, and we invite you to take part in the preparation of this event, “- emphasized Florence Hvorostovskaya.